The crown jewel of the National Football League, Lambeau Field is a year-round destination venue to be enjoyed by Packers fans in a variety of ways. Year after year, it consistently tops the lists of the best stadiums in the NFL. USA Today Sports even says Lambeau is the only one that would appear on a sports bucket list. After undergoing a series of renovations that added a host of new amenities and attractions, Lambeau has truly become the all-seasons entertainment center of Green Bay—its capacity is just 25,000 seats shy of the city’s population! To help you select your seating location at Lambeau Field in Green Bay, we have views from different outdoor seating categories, as well as from the skyboxes and club seats. These are the traditional outside bench seats that range from row 1 to row 60 all the way around the field. The seats are aluminum bench style, without seat backs, and are essentially the same design as when the stadium was built in 1957. If you desire a seat back, portable ones may be rented as you enter the stadium. The outside bench sections are those with three-digit numbers, starting with “1”. Examples would be Sections 119 and 120, which are outside bench seats in the middle of the field, with rows 1 through 60 represented. Even numbered sections on the sidelines are on the west side (“Home Side” or “Packers’ Side”) and odd are on the east (“Visitor Side”). The outside bench seats give you access to the regular restrooms and concession stands in the concourses. Vendors selling food and beverages walk up and down the aisles. There is no shelter from rain here, unless you go into the tunnels to the concourses. There are TV monitors broadcasting the game in the concourse. You also have access to the atrium area, where the Pro Shop, Packer Hall of Fame and various new restaurants and attractions are located. These are similar to the 100 Level Seats described above. The 300 level seats were newly constructed at the top of the 100 level seats as part of the stadium renovation in 2002-2003. They are in sections with three-digit numbers, starting with a “3”, and extend all around the stadium, except on the east sidelines. (Examples: sections 304-354) The number of rows varies, but most have ten rows. These rows are at the top of the 100 level rows, but are renumbered starting at “1”. Therefore, row “1” in the 300 level is typically 61 rows off the field. The 300 level is not considered an upper deck, but rather an extension on the same level as the 100-level seating. There is a concourse that serves the 300 level with restrooms and vendors. To get to this level, you can go up walk ramps from the main concourse, or enter the stadium through the tunnels on the main concourse, and then walk up the aisles in the 100 level to the 300 level. There is free access between the 100 and 300 levels and those sitting in these areas may use either the upper or lower concourses. These seats were constructed as part of the 2013 rennovation of Lambeau Field. They are located in the South End Zone and Corner Areas of the stadium, and are above the 300 level.They are regarded as more luxurious seating as they have seat backs and cupholders (unlike the bench seats in the 100 and 300 levels), as well as elevator access. They also have wider seats with the 600 level being 2 inches wider than the 700 level. These areas of the stadium also have greater quantities of restrooms and concessions per capita meaning shorter waits for use of those facilities. The Club Seats were installed with the stadium renovation completed in 2003. There are two types of Club Seats, indoor and outdoor. Both types give you access to the exclusive “Stadium Club” area on the upper east concourse, with many food and beverage specialty stands, bars, restaurants, and executive styled restrooms, as well as the new viewing platform below the North Endzone Scoreboard. These are above the 100 level outdoor bench seats. They are located in the sections with three-digit numbers, starting with “4”, and extend along the east sidelines. (Examples: sections 403-435) There are about ten rows in each section. The outdoor club seats have comfortable molded chairs with seat backs and cup holders. You may order food and beverages from the various kiosks and concessions stands in the Stadium Club area, as well as access the new North Loft viewing deck below the North End Zone scoreboard. There is no protection from inclement weather without entering the adjacent “Stadium Club” area. These are all located at the NORTH END of the stadium, above the 300 level seating. They are inside, in a setting similar to the skyboxes, but designed for use by individual patrons. They are located in the sections with three-digit numbers, starting with “4” and “6”. (Examples: sections 470-492 and 670-694) Since they are inside, they are climate controlled, with heating in the cold seasons and air conditioning during warm weather games. You are fully sheltered from rain, snow and inclement weather. You may order food and beverages from the various kiosks and concessions stands in the Stadium Club area, as well as access the new North Loft viewing deck below the North End Zone scoreboard. Television monitors are positioned so you can view play by play, and replays from your seats. 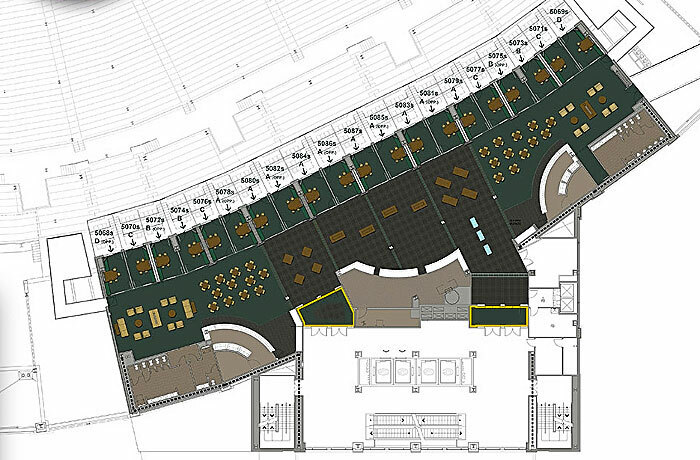 Another type of “club seating” is the Champions Club in the South Endzone area, newly completed in 2013. 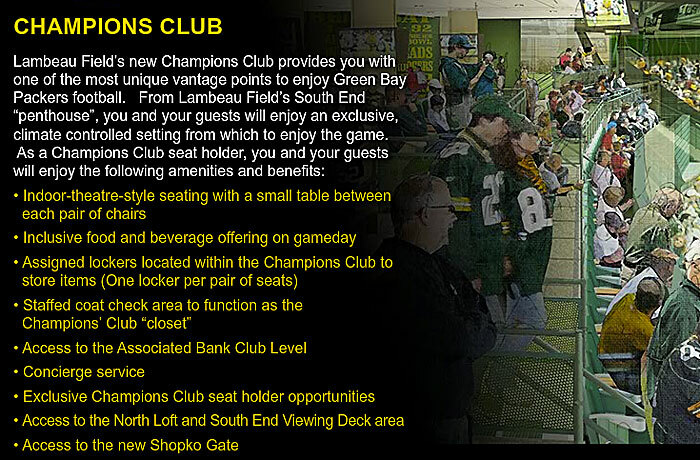 For more information see the section below regarding the Champions Club seating area. The private suites and terrace suites (both sometimes referred to as “skyboxes”) are located around the top of the stadium. The private suites extend on each side from about the endline area to the middle of the field. 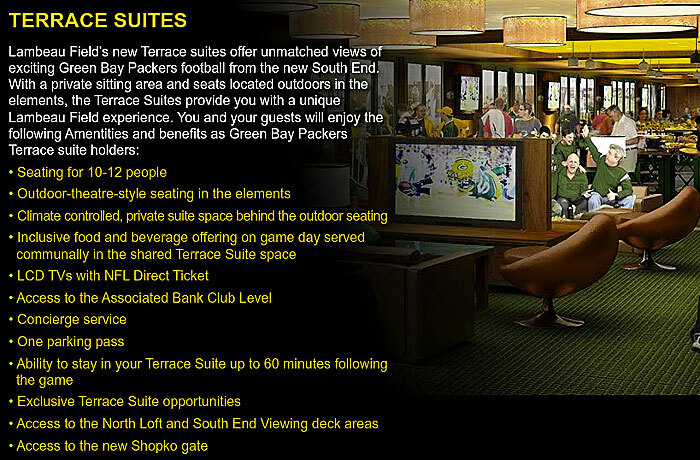 The terrace suites were completed in 2013 and are situated in the South endzone area. A description of the two different types of suites follows below. As mentioned above, the private suites extend on each side of the stadium from about the endline area to the middle of the field. There are three levels, and the private suites are designated with four-digit numbers, beginning with “4″, “5″ and “6″. (Examples: 4000-4050, 5000-5067, and 6000-6067). Patrons may access the Private Suite level through the Bellin Health gate, available only to private suite and club seat ticket holders. Most private suites have a capacity of 16-20 persons, but a few are larger. The private suites are very luxurious with comfortable seating, wide expansive glass viewing of the field, temperature controlled comfort, television monitors, lots of cupboards, storage, and counter space, a table, clothes closet, refrigerator, ice makers and many other amenities. They offer privacy for your exclusive group of friends, customers or colleagues. Food and beverages are ordered before the game by you from an extensive catering menu. The Skyboxes are sold on a unit basis by the game or season, and are sold as a part of a package of entertaining features and amenities. They are sometimes sold on a seat-by-seat basis. 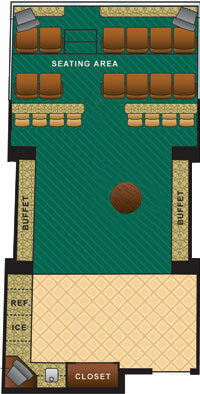 Click for for a private suite example floor plan. Private suite patrons may also access the North Loft viewing deck located below the North End Zone Scoreboard, and enjoy a gorgeous panoramic view of the game.